Recap continues after the jump. Monday afternoon was drawing to a close when David Bass announced that we could either continue questing in the origin worlds or try the Black Talon flashpoint. I have to admit that part of me was tempted to keep noodling around on Nal Hutta, but then I realized if I did that I would have to go on the podcast and say that I decided to keep killing ten rats rather than try the Imperial flashpoint. Not just any flashpoint, but the Kill the Captain flashpoint. So Carla and I teamed up with Serge from SWTOR Life to tackle this early dungeon. David Bass sat down and performed secret keystrokes that magically brought our characters up to the appropriate level. Hooray, insta-level! Then he performed more secret keystrokes…which apparently broke the game. Hooray, forced game break! It felt good to get up, stretch, and focus my eyes on a point farther than eighteen inches from my face. I don’t have the stamina for marathon gaming sessions anymore. Eventually, we got into the flashpoint. Carla and Serge brought their Imperial Agents, and I brought my Bounty Hunter and healing companion, Mako. “That’s good,” Georg Zoeller told me. “She will heal the other party members too.” Georg liked to appear suddenly behind you and make you nervous. I made sure not to use the ASWD keys to move. The opening cut scenes went by quickly. I found myself really caring about winning the conversation roll and getting frustrated when I didn’t. Furthermore, Mako’s inconsistent responses to my choices really messed with my head. Does she like mean? Does she like nice? She was unfathomable. I won and lost many Affection Rating points with her during the Black Talon conversations. Then the choice was upon us. Kill or spare the captain? I had been playing neutral to mean on my Bounty Hunter, so it seemed more natural to pick the Dark choice. I clicked on the bottom option. Just as I was wondering which outcome our party would pick, the camera cut to Carla’s Imperial Agent, and BAM! The captain was no more. My screen flared red to show that my heartless choice had earned me some Dark Side rep. I don’t remember if Mako liked this or not. By this time I had stopped trying to figure her out. Once Carla took out the captain, there was no more worrying about my conversational choices or whether my companion was pleased or annoyed with me. Republic forces were on their way and we had things to kill. What we saw of the flashpoint was exciting, fun, a bit hectic. We took down a boss or two, and Serge suggested we stop since we’d be leaving for Dave & Buster’s soon. Part of me (the spirit) wanted to see more of the flashpoint, but the other part (the body) was telling me that it was high time I stopped sitting in front of a computer. My back! My creaky knees! My carpal tunnel! At 7:30 David Bass whipped out his phone and pronounced, “The taxis are here.” He bounded off to greet them, and we slowly migrated out of the building. A line of taxis waited at the curb and we clambered into them in groups of four. Our driver asked where we were going and didn’t seem to have any idea where the local Dave and Buster’s was, which was bad since we were all from out of town, but it turned out that it is not that difficult to get someplace when all you have to do is follow the fleet of yellow cars in front of you. Dave & Buster’s wasn’t quite ready to receive a bunch of totally jazzed gamer geeks, so we hung around outside and talked about loving Black Talon and how some people leveled twice as fast (Darth Hater) as others (me). Lordhammer from TOR Syndicate roamed through the crowd and made everyone introduce themselves on camera. At last, a way for me to put names to faces! While we were waiting outside, Eric Musco said something completely incongruous that made us wonder if this was the same Eric Musco who has been doing a SWTOR podcast for the last two years, much of which had been devoted to snarky comments about the Fourth Pillar. Blank stares. Then a burst of laughter. Someone may have reached over to muss his hair. I know I wanted to, except his hair is not very muss-able. Fun fact: story is really important in SWTOR. It’s not only important in the sense of providing context for your adventures, but also important in the sense of affecting game events, crafting timers, and even gear. You can be sure that min-maxers will discover the “right” story choices necessary to get specific outcomes for elite progression. I asked Daniel Erickson how he felt when he thought about players Thottbotting their way through SWTOR. Without saying a word, he made a sad face, and drew an index finger from the corner of his eye down his cheek. Two days later, I would Tweet: “#SWTOUR memory: Making Daniel Erickson cry.” Achievement unlocked! Master of Ceremonies David Bass announced that it was time to enter. We passed through the front doors, and streamed into a room where the pool tables had been transformed into dining tables. Drinks, conversation, food. By then it felt like being at a gathering of old friends. People moved from table to table, plenty of good-natured exchanging of insults all around. Stephen Reid told his release-date-is-like-Christmas story. Carla reminded him that in Texas they celebrate Christmas in July [DISCLAIMER: this is NOT in any way hinting that SWTOR will be released in July.]. 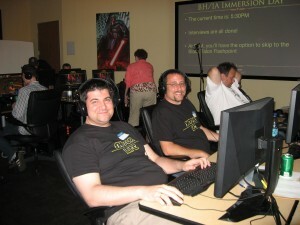 Talking with other SWTOR fans was a blast, but we all had game cards burning holes in our pockets, so we allowed ourselves to be drawn to the flashing lights and sounds of gunfire coming from the gaming areas. As we roamed the aisles, people began peeling off to individual games. Jurassic Park! Time Crisis! Daytona! Carla’s from Texas, so she liked the sound of that. At some point I heard someone shouting our names, but killing zombies is serious business so I didn’t look to see who it was. I found out later though, when Musco Tweeted this picture. When our guts and gore mayhem was interrupted by the House of the Dead cut scenes, I had an epiphany. The characters stopped shooting and told us important things, often in the form of a cinematic flashback. My god, I thought, this game has STORY. I must tell David Bass. One of the highlights of the evening was Daytona racing. After killing zombies, racing cars is my next favorite video game pastime. After a few rounds with a few of the fan sites, Zach Brown leapt up to get more players so we could have a full eight-player show-down. Fan site members filled the seats, the timer ticked down and we were off! Engines revved, cars jostled each other for the lead. My driving strategy: 1) don’t be the hot dog on the track, and 2) avoid crashing. It’s not a very exciting strategy, but when everyone else is ramming into each other for fun, it can be extremely effective. The race ticked down to the final minutes. 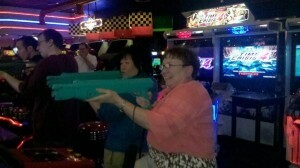 Suddenly, I realized that Carla and I were in first and second place. Suddenly, other people noticed too. Musco shouted, “WOMEN DRIVERS” at us as we left the battlefield. 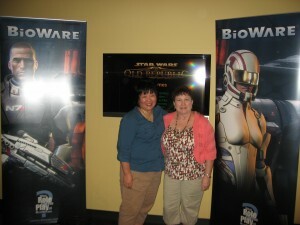 Carla and I smiled, satisfied that we had earned some girl gamer cred, even without the victory. Later I ran into Stephen Reid, David Bass, and the TORWars fellows, Jeff and David. They were talking about podcasts and how it’s important to distinguish yourself in a crowded field of SWTOR fans. By which Stephen meant, Corellian Run Radio, for all its points, good and bad, would never ever ever be considered one of the short podcasts. Fun fact: when Carla and I first conceived of our podcast, our goal was to keep it to approximately thirty minutes. Carla had done some research and learned that the average commute is twenty minutes, and people like their podcasts to fit in that twenty-minute window. We hit that target exactly once. Stephen Reid actually mentioned his commute in relation to podcast length. Stephen’s commute is ten minutes. Even TORWars cannot meet this strict standard. Ever the gentleman, Jeff assured me that even though Corellian Run Radio can be one of the longest podcasts in the history of podcasts, we are always a pleasure to listen to. And then he offered me a free TORWars T-shirt. I made a mental note to invite him onto our podcast. Stephen, despite the fact that he wishes our average podcast would not require nine full commutes to finish, was very gracious when I asked if he and David would be a guest on Corellian Run Radio. I promised not to make them sit through an entire recording session. He was clearly relieved [Editor’s note: our behind-the-scenes post-Fan Site Summit conversation will post as soon as it makes its way through the secret BioWare approval process. Stay tuned!]. The evening wound down. I chatted with Lordhammer and BioWare Web Designer Alyssa Gobelle about Star Wars Galaxies and the fact that Austin is a small town with a lot of game industry people floating around so one must be careful not to talk about work when out to lunch. David Bass disappeared, clutching a handful of game tickets in his hand. 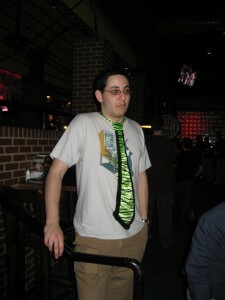 When he returned, he was sporting a fairly garish lime green tie with black zebra stripes. It was approximately three times as wide as is legally permitted in any Wall Street firm. At midnight the taxis arrived to take us back to our hotel. By this time, I was really dragging, but Carla and I had one more appointment: our post-midnight recording slot with Mos Eisley Radio. Alan, a member of the MER community, greeted us at the door. He and his friend Eric had driven five hours to meet Zach and Evan. That’s dedication. I don’t remember much of the segment we recorded for MER except for the part where Carla called people out and told them to chase Musco down the next day when we would get a chance to try PvP for the first time. That and the hotel manager knocking on the door to say there were noise complaints about our raucous sessions. I blame Dover. Chastised, I slunk off to my room. Dreams of PvP danced in my head as I drifted off to sleep. Next: Gabe Amatangelo seduces us with PvP talk.